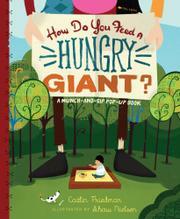 HOW DO YOU FEED A HUNGRY GIANT? A dismayed lad learns that 10 slices of pizza, 33 jars of peanut butter and 200 cookies are only hors d’oeuvres for a peckish giant. What to do? Looking decidedly woebegone in Nielsen’s very simple, graphic-style illustrations, the towering giant that silently appears in the backyard sports a reversible sign: “Food” on one side, “Please” on the other. With repeated choruses of “Seriously, you aren’t going to believe this,” and “It’s back to the kitchen for me,” the well-intentioned young narrator nearly empties his astonishingly well-stocked fridge. (His dog, Cowgirl, provides a running side commentary: “That’s one thirsty giant.”) Until, at last, Mom steps in and sets to work concocting a “Ginormous Blueberry Muffin,” “Mega-Pigs in Blankets” and like oversized dishes—all of which are provided with reasonably nutritious “Recipes for a hungry giant (or 8 little kids)” on a flimsy detachable flier. Besides the aforementioned signboard, the sparse but well-designed moveable parts include a pull-up giant on the front cover, a swimming pool filled with chocolate milk that’s slurped up thanks to a pull tab and a big climactic pop-up of the now-smiling giant contemplating a table filled with properly scaled chow.